An operation performed on two rational numbers (expressed as reduced fractions) in which you add the numerators together and add the denominators together (or, as your children might say, adding fractions the way you always wanted to!1). The standard name for this operation is mediant, and it's also called "freshman addition". The name "Farey addition" is from Robert Devaney. The result of a Farey addition is always somewhere between the two original fractions. If the two original fractions have no fraction between them with a smaller denominator (example: there is no fraction between 1/3 and 1/2 whose denominator is smaller than 2) then the result of the Farey addition is the fraction with smallest denominator between them (in this example, 2/5). If the two original fractions are the internal angles (that is, they are each reduced fractions, see relatively prime) of two mu-atoms, then Farey addition gives the internal angle of the inner neighbor of those two mu-atoms. In this figure, the two two mu-atoms R2.2/5a and R2.1/3a have internal angles 2/5 and 1/3 (respectively). Their inner neighbor is R2.3/8a, and its internal angle is 3/8, which is the "Farey sum" of 2/5 and 1/3. Similarly, the inner neighbor of R2.2/5a and R2.3/8a is R2.5/13a. Again, its internal angle 5/13 is the "Farey sum" of 2/5 and 3/8. There is an efficient algorithm for "finding" a mu-atom with a given internal angle. See binary search for internal angle. See also smaller neighbor, larger neighbor. 1 : The phrase "adding fractions the way you always wanted to!" is from Robert Devaney's How to Count and How to Add. 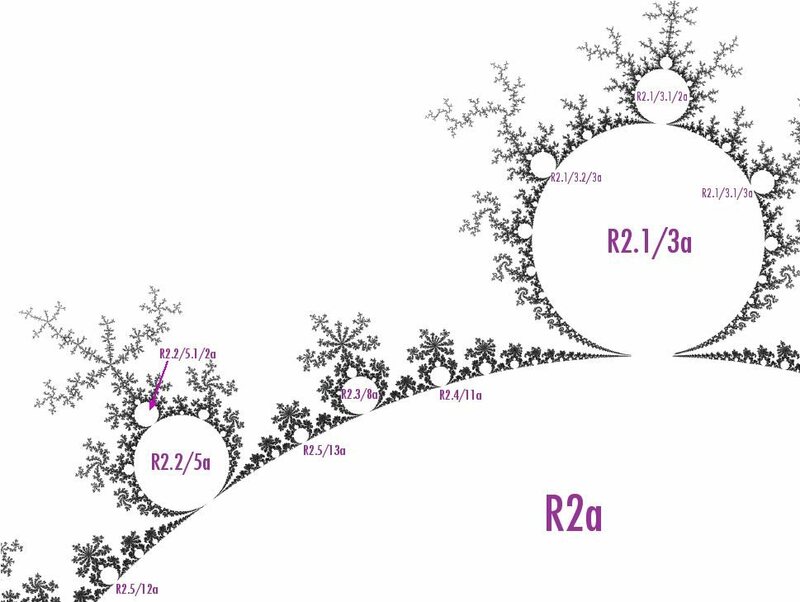 Robert Devaney, The Mandelbrot set and the Farey tree, 1997. Robert Munafo's home pages on HostMDS © 1996-2018 Robert P. Munafo.